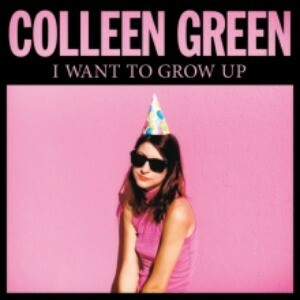 The evolution of Colleen Green continues apace. I Want To Grow Up, her second LP for Hardly Art, is a gratifying leap forward in the Green saga, morphing out of the stoner indie punk stage to find grace in what we’ll call G-Pop, a confection equal parts self examination and breathless snark. Tapping touring buddies from Jeff The Brotherhood and Diarrhea Planet, Green has conjured a bright shiny beast of a record, glowing with the melodic canniness of Weezer, or her beloved Blink 182, crossed with the airtight construction of The Cars. Green leaves behind her stoner days and goes deeper, looking into the mirror on the title track, and both parts of “Things That Are Bad For Me.” “TV” and “Pay Attention” are polished gems that testify to just how far Green has come. The former constructs an anthem from the simple precept: “TV is my friend”, while the latter wraps a bow around ADD, coming to grips with it over grueling guitars. “Grind My Teeth” is a buzzing pop punk delight that will keep the diehards happy, while “Deeper Than Love” is the biggest step away from her early work, both musically and thematically, and the breathy, unflinching cut stands as her triumph.